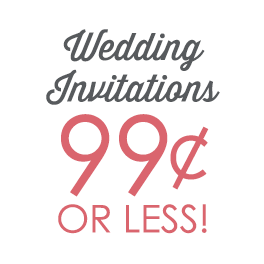 Just because we offer “cheap” wedding invitations doesn’t mean they’re low in quality. 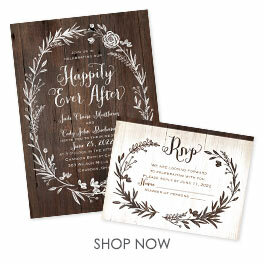 In fact, we’re committed to offering discount wedding invitations that rival those of our higher priced competitors. How do we do that without sacrificing quality? Through efficient printing practices and clever design. We offer several types of wedding invitations (all shown right here) designed to keep costs low for you while remaining stylish and retaining a high standard of quality. Whether you’re looking for all-in-one design or invitations that accommodate online RSVPs, we’re always thinking about what you need and how to design something that fits your budget. Once you’re finished shopping our best selection of value wedding invitations, be sure to shop matching pieces to create a coordinated ensemble.